This is the sixth in a series of "blogicles" on how Mess Mapping™ and Resolution Mapping™ processes can be used to represent, analyze, evaluate Wicked Problems and then to choose actions that ameliorate the Wicked Problem at hand. A Mess Mapping™ process is organized and structured in response to the nature of the principal Wicked Problem to be addressed. Although each project is different, there are some basic consistencies across problems and consulting engagements. Step 1. Initial Interviews and Analyses. We—the facilitators—engage in preliminary analysis based on interviews with stakeholders and in many cases, with outside subject matter experts. The number of interviews and the specifics of the interviewees are built into the project plan negotiated with the sponsoring organization. The interview information may be supplemented with publicly available information on the Web and from other sources. We create a rough cut chunking and structuring of the information and create a template using computer tools. Step 2. Identifying Interlinked Problems. In a stakeholder meeting (that may include outside subject matter experts), participants create a map of interlinked problems as seen from different vantage points, for example, the perspectives of various relevant organizations, institutions, markets, governments, etc. The chief meeting objective is a first cut at a common mental model of the presenting Wicked Problem and other embedded and linked Wicked Problems. Following the meeting, the facilitators create a draft Mess Map using computer tools. Step 3. Identifying Causal Factors. The task force (working group, management team) meets again to edit the draft Mess Map diagram and to identify principal influences and causes of the interlinked problems. Facilitators document this evolving information. Before the next meeting, the facilitators create a more refined Mess Map diagram. Step 4. Analyze Major Structural Factors. The working group then meets to examine the structural factors underlying the major problems and issues. The structural analysis may suggest interventions with the greatest impact on the problem(s) at hand. Alternatively, the group may build on the situation, causal, and structural analyses by considering alternative future outcomes and key milestones using a Resolution Scenario Mapping Process. Gives task force members a successively more detailed and integrated document they can share with colleagues at their home institution (thereby, seeding a more common view of the problem at hand). Increases the likelihood that participants will talk to and not past each other. 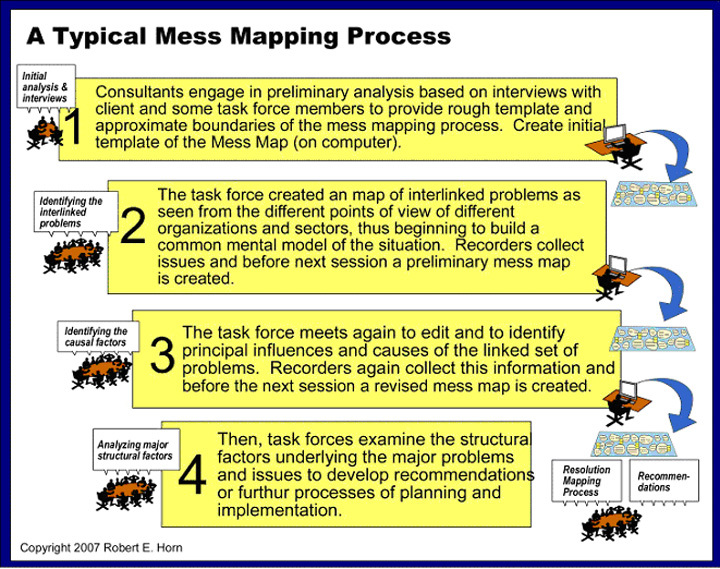 Having described Mess Map Diagrams and the Mess Mapping process and their benefits, we now turn to Resolution Mapping processes and how they can be used to address Wicked Problems. This series of blogicles has been jointly authored; our names appear in alphabetical order. Mess Mapping and Mess Map are trademarks of MacroVU, Inc. Resolution Mapping is a trademark of Strategy Kinetics, LLC.